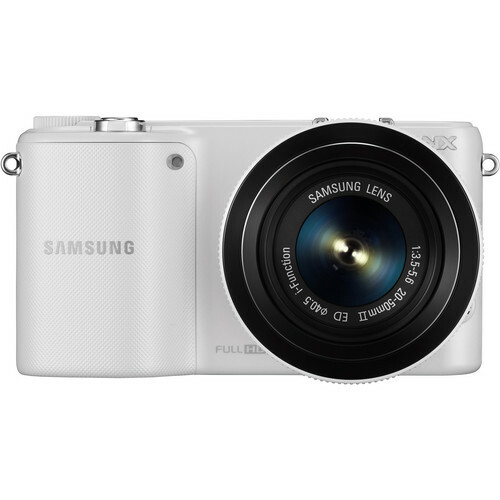 Buy New Samsung NX2000, 20-50mm, 20mp, Touch LCD 3.7", WIFI (Pink) Free 16GB Malaysia At FotoZZoom! * Actual product may differ than product image shown. More than just taking pictures, with the Samsung NX2000, you’re telling stories. An ultra-sensitive 20.3MP APS-C CMOS sensor allows you to create images full of detail and colours that fire up the imagination. And the spacious 3.7"(93.8mm) WVGA touch screen gives you plenty of room to hone your craftsmanship, making it ideal for photography enthusiasts like you. And since your photos should be as easy to back up as they are to create, AutoShare simultaneously sends every photo you snap to your smartphone. You’ll now have an extra copy of your photos that you can effortlessly share with friends and family. You may not be a professional photographer, but with the 20.3MP APS-C CMOS sensor, you can easily shoot like one. The sensor offers the highest resolution in its class to help you capture high-quality images with lifelike colours. And since the sensor is also the largest used in a mirrorless camera—measuring 23.5mm x 15.6mm—it collects the most light. That makes the sensor perfect for outfocusing photography, and for shooting images without noise in low-light situations. * The largest touch screen available in the interchangeable lens compact system camera (CSC) category as of May 2013. The NX2000 boasts the largest screen in its class, with a stunning 3.7"(93.8mm) WVGA display that serves up plenty of space for reviewing and editing your masterpieces. You get full touch-screen action, with no physical menu buttons taking up valuable real estate. The display offers up the full spectrum of colours, so what you see on the screen matches what you shoot. Send every picture you take to your mobile phone via Wi-Fi connection in a snap - to make backing up and sharing your high-quality photos super easy. Set up AutoShare once and the camera saves it as the default setting. AutoShare also GPS tags your photos with your Smart Phone. Assign your DIRECT LINK button according to your needs and purpose with the embedded DIRECT LINK Wi-Fi hot key functionality to immediately launch into your most favoured activity – AutoShare, MobileLink, Remote Viewfinder, SNS " Cloud, Auto Backup, Email, and More! With Cloud, you’ll never run out of room in your memory card or lose valuable pictures, even on the go. Wirelessly save images to a cloud service such as Microsoft Skydrive or a regional cloud provider, then view them anytime on your smartphone, tablet or download them to your PC later. You can instantly email or post must-see images and videos to your favorite social networks. Just select and upload wherever you have a Wi-Fi connection, and then add tags and comments. Share with your Blogger followers, or post to Facebook, Picasa or YouTube — and many more social networks. When a firmware update is available for the Samsung SMART CAMERA and you connect to a Wi-Fi network, a notification window will pop up on the camera’s screen. Connect your camera to your PC for the upgrade, and start using the latest features without delay. The NX2000 takes photography to a whole new level by making it faster and easier to connect the camera to your smartphone or tablet with NFC (Near Field Communication). NFC automatically secures a Wi-Fi connection for you, so you can share what you capture. Place the device near the camera to find and easily activate the Samsung SMART CAMERA App. * If the app is not installed on your devices, you will be directed to the App Store where you can install the app. The pictures you take will tell stories that rival those created by the pros. Smart Mode settings such as Waterfall and Light Trace enable you to photograph the beauty of cascading water or flowing light trails. Use Action Freeze to capture the intensity of a car race, or merge various exposures with Rich Tone to create evocative images. Let Creative Shot enhance the emotion of any scene or moment you capture. Make vacation stills and videos pop off the screen with True 3D Creator. The interchangeable-lens system of the Samsung SMART CAMERA NX2000 lets you shoot stills and movies in 3D via Samsung 45mm 2D / 3D lens. When you’re done shooting, let your friends back home feel as if they were there with you, by showing off your stunningly vivid adventures on a compatible 3D HDTV. The Samsung SMART CAMERA NX2000 may not look like a camcorder, but it capably captures Full HD 1080 / 30p video. With uncompromising performance bolstered by an 18-200mm lens and wide zoom capability, the Samsung SMART CAMERA NX2000 delivers smooth, professional-looking videos that play well on your HDTV. When you’re ready for showtime, an HDMI interface lets you transmit your vision straight to the big screen. When you’re shooting fast-moving action, effortlessly capture the entire sequence with a series of brilliantly clear stills. The Samsung SMART CAMERA NX2000 lets you shoot continuously at an ultra-fast rate of 8.6 frames per second to ensure you get the shot you want. The advanced autofocus system brings crystal clarity to fast-moving subjects, and a short shutter release lag helps you capture the fleeting moment before the subject moves out of frame. Even in the dark, you can capture a natural-looking portrait with amazing colour retention and detail. The upgraded Wide Range ISO of the NX2000 lets you shoot up to ISO 25600, making it more sensitive to light than the previous model, which produces much clearer images. Shoot in the dark—indoors and out—and enjoy photos with minimal noise and blurring. Whether you’re shooting 2D or 3D, the DRIMe IV image processor accurately captures all the special moments in amazing quality. It’s faster and improved colour reproduction and noise reduction performance ensures you’ll treasure your memories with enhanced Full HD movie quality. You have a split second to take the shot your family will be talking about for generations. With a shutter speed of 1/4000s—and fast autofocus system—the Samsung SMART CAMERA NX2000 lets you capture a cyclist whipping by or a skateboarder in midair, without a hint of motion blur. The i-Function system makes it easy to adjust key camera settings through a single button and the value ring located on the lens, instead of the body. Designed for the novice and expert alike, i-Function lets you quickly choose the settings that best fit the moment—and your expertise. Adobe Photoshop Lightroom 4 is the perfect match with the NX2000 to bring out all the details for crisp professional looking photos. Organise photos by the location they were taken with GPS tagging. View and make adjustments to video clips, turn them into still images, or trim and edit according to your needs.